Bob Baffert had won six Rebel Stakes (G2) in the decade of the 2010s, but he is officially 0-for-2 in 2019 after striking out with two odds-on favorites in the two $750,000 divisions of this year’s key Kentucky Derby (G1) prep race at Oaklawn Park. Meanwhile, the winners of the two divisions of the Rebel Stakes — the Steve Asmussen-trained Long Range Toddy and Richard Mandella’s Omaha Beach — both improved markedly and stamped themselves as legitimate up-and-coming contenders for this year’s Run for the Roses. Baffert entered Saturday’s Rebel with a pair of undefeated 3-year-olds at the top of many people’s Derby rankings — but exited with losses for both Los Alamitos Futurity (G1) winner Improbable in the first division, and Breeders’ Cup Juvenile (G1) winner Game Winner in the second division. Both horses ran well to be second, however, and Baffert didn’t seem too displeased with either horse’s effort, noting that both were returning from layoffs for their sophomore debuts and had their training/prep schedules altered by the ongoing drama at Santa Anita. Both Game Winner and Improbable will live to fight another day, but Rebel Day belonged to Long Range Toddy and Omaha Beach, who each raised their Derby stock considerably with their victories. Long Range Toddy seemed to be stalled in the mid-80’s Beyer speed figure range this season, but finally broke out from that in a big way to earn a career-best 95 in the Rebel’s first division, which was widely considered to be the stronger heat. Omaha Beach held off a fast-closing Game Winner to earn a 96 Beyer speed figure in the second division. The victory was notable because it continued a steady upward progression for a horse that has evidently improved greatly since being switched from turf to dirt. We will now wait and see where each of these horses will go next, and whether or not the Santa Anita Derby will be an option for any of them (Game Winner, Improbable and Omaha Beach are all stabled at Santa Anita). Santa Anita is expected to re-open for racing on March 29, and the SA Derby is scheduled to be run four weeks out from the Kentucky Derby on April 6. Two horses potentially headed to the SA Derby were flattered by Omaha Beach’s victory. Nolo Contesto, trained by John Sadler, saw his stock improve after beating Omaha Beach in a one-mile Santa Anita maiden race on Jan. 4. In turn, another horse whose stock rose is Roadster, who beat Nolo Contesto when the two met in an allowance optional claiming event at The Great Race Place on March 1. Trained by Bob Baffert, Roadster returned from a layoff caused in part by corrective throat surgery and looked like a legit Derby contender, even though he may only be the third- or fourth-stringer currently in his own stable. Baffert also trains Mucho Gusto, who heads to the Sunland Derby this weekend as the likely heavy favorite after crushing the Robert B. Lewis Stakes at SA last time out on Feb. 2. Based on the latest results, here is an updated list of current top Kentucky Derby contenders. Code of Honor – Defeated a loaded field in the Fountain of Youth at 9-1 odds. Looked good as a juvenile, with a runner-up finish in Belmont’s Champagne (G1), but was all but forgotten by some after a fourth-place finish in the Mucho Macho Man Stakes (broke bad, rushed up into a four-way duel and faded as a result of those early efforts). He made up for that debacle with a strong Fountain of Youth victory for trainer Shug McGaughey. Going to either Florida Derby or Wood Memorial next. War of Will – Like Omaha Beach, he is much-improved since switching to the dirt. Mark Casse trainee is 3-for-3 on the main track including back-to-back graded stakes wins in the Lecomte and Risen Star at Fair Grounds. Looking very good heading into the Louisiana Derby on March 23 as the favorite. Game Winner –Breeders’ Cup Juvenile winner finally got his 2019 Debut under his belt and was flying late when beaten a head. Tops the loaded barn of multiple Triple Crown-winning trainer Bob Baffert. Looking for a spot for this final prep. Was the BC Juvenile a negative key race? It sure seems like it. Improbable – Baffert’s second-stringer owns a 7-length stakes victory at one-mile at Churchill Downs, which is a major feather in his cap. Obvious talent may have problems with maturity, as his focus was all over the place in the stretch run of his loss in the Rebel. Baffert needs to sort out the next steps for all his various contenders. Roadster – Yet another major Baffert contender; he beat Nolo Contesto, who beat Omaha Beach. Earned a promising speed figure in that 3-year-old debut win. The sky is the limit and the SA Derby is next. 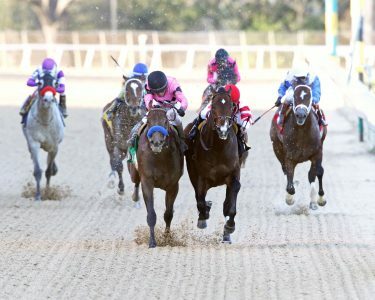 Tacitus – The winner of the Tampa Bay Derby for trainer Bill Mott beat a big field, earned a solid speed figure, and will be given the chance to develop further with another prep race. Omaha Beach – Knocked off the undefeated Game Winner and shows the rapidly-improving pattern you love to see from a sophomore at this point in the season for trainer Richard Mandella. Others in the hunt: Nolo Contesto, Mucho Gusto, Long Range Toddy, Hidden Scroll, Bourbon War.